Images from FullView ® cameras speak for themselves. In a testament to the superiority of FullView's design, its images have been unfailingly superior to those of others since FullView's very first rather unsophisticated implementation in 1995, no matter who or how large this other, whether Microsoft earlier or Google now, both using Outwardly Pointing Cameras. Panoramic images may be displayed in a variety of styles, with the choice of style depending not only on the application, but also on the shape, size and aspect ratio of the display. Described below are four mutually non-exclusive display styles: SingleView™, SplitView™, SelectView™ and PlanarView™. The SingleView™ display style provides a single unified image of a scene, this image perhaps cylindrical and stretched open, or spherical and flattened like a world map. The SplitView™ display style, patented by FullView, consists of two stacked 180° or wider cylindrical images, each image stretched open, with one image providing a direct forward view of the scene and the other providing a mirrored rear view of the same scene. Stacking images in this way provides a better sense of fore-aft and left-right while also providing better screen coverage of a typically proportioned 4:3 display. The SelectView™ display style allows a user to select one or more high-resolution views in any direction from a lower-resolution image, this lower-resolution image perhaps in SingleView™ or SplitView™ format. PlanarView™ displays a scene as it would appear on a flat (plane) window pane facing the viewer — as in a "normal" photograph or in a Renaissance painting — rather than as it would appear on a curved surface, as in SingleView™. With PlanarView™, straight lines in the scene appear straight in the image, rather than curved as in SingleView™. However, PlanarView™ is practical only when the horizontal field of view is less than about 90°, beyond which span objects appear increasingly distorted. Below is a PlanarView™ high-resolution image window embedded in a SelectView™ display. 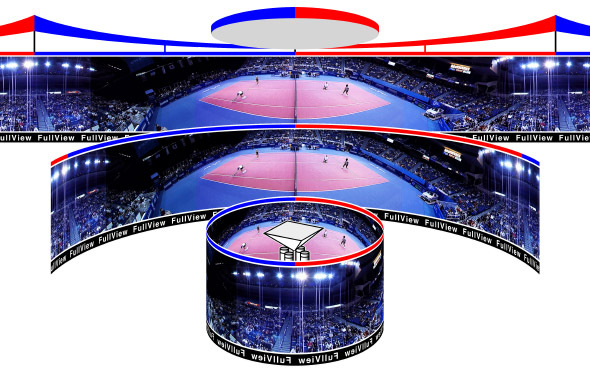 Below are three FullCircle™ color-video image stills, each video still with a horizontal field of view that is FullCricle (360°) and a vertical field of view that is approximately ±25°. Each of these stills was acquired by a predecessor of one of our former products, the FC−1005. FullCircle™ image of an exhibition tennis match in Hartford, CT, November 1998, with Chris Evert stretching and Martina Navratilova kneeling. Click on the image above to see it at full resolution. Vic Nalwa (left) at Bell Labs, Holmdel, NJ, September 1998. The Looking Glass Studios, New York, May 1999. 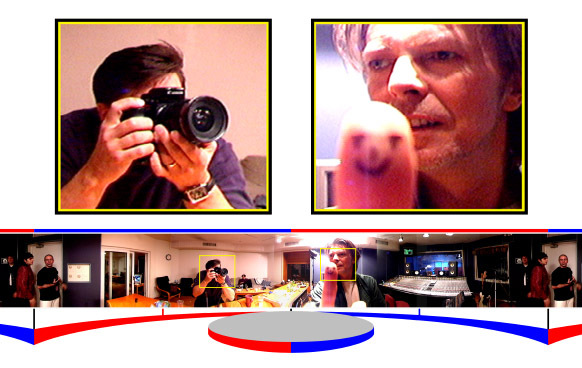 Below are three HalfCircle™ black-and-white-video image stills, each video still with a horizontal field of view that is approximately 200° and a vertical field of view that runs from approximately 15° above the horizon to 45° below. Each of these video stills was acquired by a predecessor of one of our former products, the FC−110. By design, each of the images below is geometrically seamless, but not seamless in brightness and contrast. The gain, shutter and aperture of each component camera below vary independently of all the other component cameras in order to optimize visibility within that particular component camera's field of view — rather than to match its image brightness and contrast to adjoining cameras. HalfCircle™ image of an open space, illustrating surveillance. HalfCircle™ image of an open space at night, illustrating sensitivity. HalfCircle™ image of the deck of an aircraft carrier.